Those who believe that phantom recoveries and phantom metrics can be substituted for reality are in for a shock in the next downturn. Stripped of artifice, there are only two kinds of media stories: those that support the status quo narrative, and those that are skeptical of that narrative. What is the status quo narrative? Simply this: not only is this the best possible arrangement of labor, assets and money, it is the only possible arrangement of labor, assets and money. It is impossible to challenge a system that is the only possible arrangement; the only option is to accept it. In effect, the mainstream media is a vast Psychological Operation (PSYOPS) aimed at persuading the American public that the status quo Imperial system of predatory, debt-based crony-capitalism that benefits the few at the expense of the many is not just beneficial to all its debt-serfs and welfare recipients, but it is the only possible system--there is no alternative(TINA). One of the greatest and most important PSYOPS of the Imperial State (U.S. Government) and its faithful lapdog the mainstream media is the unemployment rate. As I will show tomorrow, the real unemployment rate is between 20% and 40%, depending on whether you think someone earning $1,500 a year selling stuff on eBay and Etsy should be counted as "employed." The federal government is delighted to count everyone earning $100 a year as employed, and equally delighted to label everyone without a job (even one paying $100/year) who doesn't qualify for unemployment insurance a job market zombie--a once living person who is no longer counted as among the living. 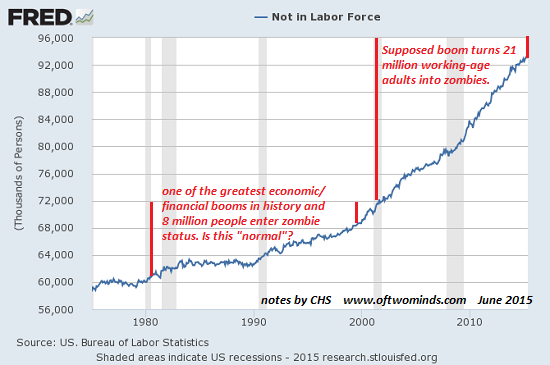 These zombies are non-participants in the labor market, i.e. not in the labor force. They might be able to work, and want to work, but they're considered zombies once they're no longer "actively seeking work." But is this the proper metric for measuring the unemployment rate? It is obvious that the unemployment rate should be calculated on the total work force (those of working age 18 - 65 who are not institutionalized or permanently disabled) and those with real jobs, i.e. ones that generate enough income to get close to the poverty line. Here is our phantom economy on display: 93 million people are no longer counted as being in the work force. They are officially declared zombies, and that's how the federal government can claim an "official" employment rate of 5.6%. 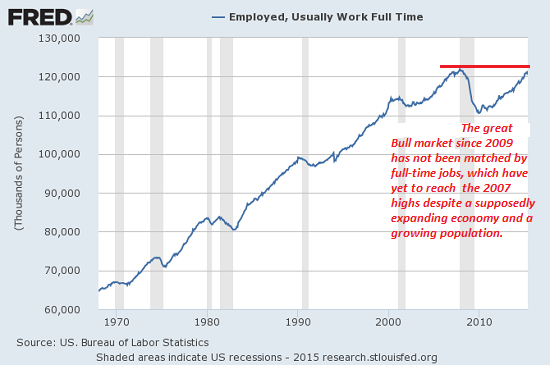 And here's the work force with full-time jobs, i.e. jobs that might support a household (or half a household) and that might pay substantial payroll and income taxes (unlike the forms of marginal employment that earn a few hundred or few thousand bucks annually). Just as we have a phantom work force--the 93 million not in labor force almost equals the 120 million with full-time jobs--Imperial Rome in its final days had phantom legions. There were no longer any active-duty soldiers in the legions, but the officers and paymasters filed their payroll chits and collected the legion's pay from the out-of-touch remnants of the Imperial Core in Rome. Just as Rome in terminal decline had its phantom legions, we have a phantom "recovery," phantom democracy, phantom GDP and phantom unemployment rate.Those who believe that phantom recoveries and phantom metrics can be substituted for reality are in for a shock in the next downturn.